For such a great start, this arc ended pretty flatly. The scientists in a Cobra installation that were responsible for synthesizing this biological weapon have no problems turning on their leader and helping the Joes out. Despite the fact there was no cure, they are able to come up with one in what appears to be an hour. The Joes are able to escape by convincing full-suited Toxo-Vipers they are all infected by the virus (yes, they are the "leaky-suit brigade" but this was a cheap plot gimmick nonetheless). Once again, Dixon delivers a story that is heavy in action and light on characterization and logic. It seems Chuck Dixon likes to pick a character or two in each book to be the comedic voice, and Lighthorse seems to fill this role. I was wrong in my prediction that was a Joe causality waiting to happen, and I'm glad. He was one of the more fun characters to read. But in a series whose main star is a silent, personality-deficient, unbeatable ninja, the competition wasn't that intense. Another good, but not outstanding, effort by Maloney. He's able to tell the story, and he tells it well, although his lack of dynamics and details leave something to be desired. 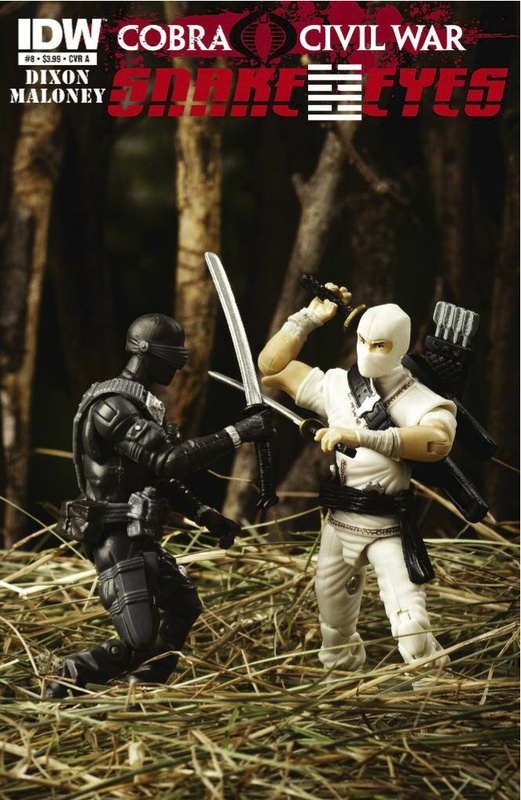 The best thing about this issue was the variant cover of 25th Anniversary versions of Snake Eyes and Storm Shadow getting ready to rumble. This issue, and indeed this whole 4-issue arc, is very passable.